Espresso is a delicate, delicious coffee beverage that takes careful handling and results in a powerful punch of rich flavor and caffeine. Espresso is different than coffee in that it's made of finely ground coffee and filtered under pressure. With the right tools, you can make it at home. Why Get An Espresso Machine? In this guide we will look at features that make up the best home espresso machine for espresso based drinks, including latte and cappuccino, in our espresso machine reviews and comparisons. The Mr. Coffee Cafe Barista allows you to choose between single or double shot options of espresso, cappuccino or latte with a one-touch control. 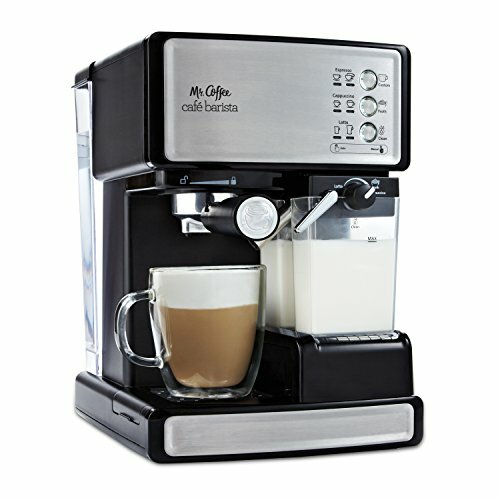 It also has an automatic milk frother for creamier cappuccinos or lattes, and it has a removable milk reservoir that fills, cleans and stores easily. It has a removable water reservoir that can be filled in the sink, plus it has a removable, washable drip catcher to help with keeping up cleanliness. Being able to clean your machine is incredibly important to keep it functioning properly. There are other things that come with this unit such as single and double shot filters, a measuring scoop, tamper and coffee recipes. However, the Mr. Coffee Cafe Barista has been known to lose pressurization capabilities and difficulty brewing espresso and frothing milk. We don’t think this is an alarm for concern, but it is something to be aware of it. There are a number of reasons for any brand or type of espresso machine to act up, one of which is not keeping it cleaned properly. 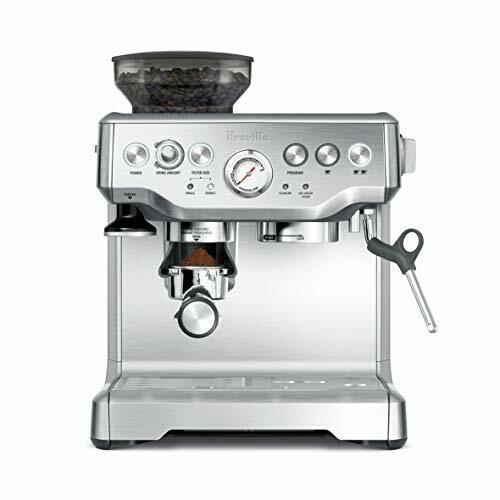 The Breville 870XL Barista is a 15 bar Italian pump espresso machine with a 1600W thermo coil heating system that’s meant specifically for express functionality. It also has a stainless steel conical burr grinder with a half lb. sealed bean hopper and a 67 fl. oz. removable water tank with a handle. In addition, it has a specialized purge function that automatically adjusts the water temperature after steam for the best possible espresso ﻿﻿extraction temperature. To help keep things clean, they have included a cleaning kit. This is especially handy for the grinder because the parts and areas are hard to access, even with a toothbrush. Something we aren’t a fan of is its plastic top and plastic sides that aren’t necessarily good for a high-temperature machine. As you may know, plastic melts around excessive heat. 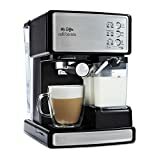 The DeLonghi EC155﻿﻿ 15 Bar Pump Espresso and Cappuccino Maker is a small espresso maker that provides a similar type of espresso with a thick layer of cream on top, as you might get when purchasing a cup of espresso right in Italy. It’s got smaller cups and because of the size of the machine itself, it shouldn’t take up too much room on your kitchen counter. The unit looks sleek with silver metal accents and has a good-sized water reservoir that makes about 8-10 shots before you need to refill it. This is easy to do because of the clear section behind the basket that shows the water level. It also has a rapid heat-up time and no waiting time between frothing and brewing. Because of the smaller profile, you’ll need a smaller vessel to fit under the frothing wand. The wand swivels but there isn’t a lot of distance between the wand and the counter top. 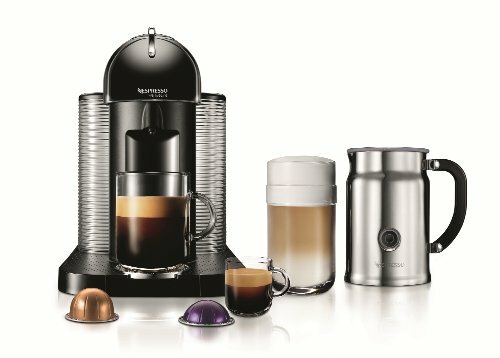 The Nespresso VertuoLine Coffee and Espresso Make﻿r includes the Aeroccino Plus milk frother which provides rapid, one-touch preparation of hot or cold milk froth. It also operates with the new Centrifusion technology that brews both coffee and espresso with a one-touch system. 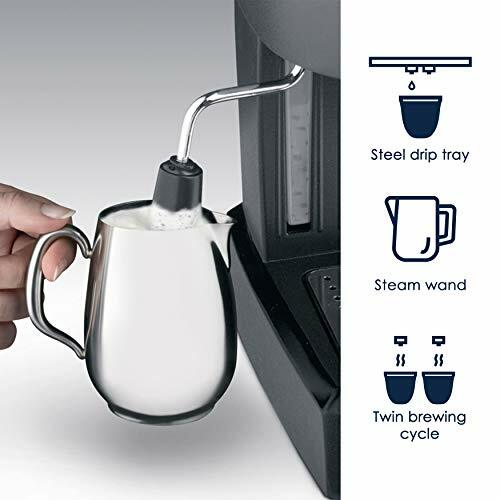 It uses capsules, or pods, for brewing coffee or espresso. It also has a capsule recognition and code reading technology intended for end-specific barometric brewing. It can use two capsule sizes: large for coffee, and small for espresso. The machine is designed for easy insertion and injection of the capsules, but it is designed for use with the Nespresso VertuoLine capsules only and not Nespreso Original Line capsules. The VertuoLine espresso machine has an automatic off-mode after nine minutes of inactivity and it has quick heat-up time of fifteen seconds. Espresso is a much more intense and luscious beverage than coffee. While many people prefer coffee for their daily wake-up, espresso is a great treat on the weekends or after a special meal. Espresso machines work under extreme pressure and heat. It's important to get an espresso machine that you can work with comfortably, especially if your early morning thinking process moves slowly. Luckily, there are many espresso machines that require only one touch to make a great cup of espresso, and these units often have milk reservoirs and filtered water reservoirs that lock into place to save the risk of burning yourself. Finally, there are now espresso machines on the market that can make espresso using beverage pods, such as a Keurig, for an easy, early morning latte or cappuccino. Espresso machines take a little practice to make a perfect cup. You'll need to make sure the machine is hot and that the pressurization feature is working properly. The water pump for proper espresso needs to go at least to 15 on the gauge to quickly dispel your espresso. If the espresso spends too long in the brewing cycle because the pump didn't reach the right pressure, you'll find it scorched and unpleasant to drink. served with crema, or coffee foam caused by brewing under pressure, on top. The more crema, the fresher the coffee beans used to make your espresso. Cappuccino is a combination of espresso and highly steamed or frothed milk. Traditionally, the ratio of espresso to milk is 1 to 1 when making a cappuccino. The milk is steamed to a froth and poured into the espresso. Once milk has been added to espresso, it's no longer espresso, but either cappuccino or latte. You can use a cappuccino maker for espresso only by leaving the milk reservoir empty. However, some of the nicest features of espresso makers for home use allow the user to set up the espresso machine, add milk to the frothing reservoir, place the cup and just tell the machine what you want. Several espresso machines that use reservoir technology are much easier to clean than those machines with the built-in water reservoir at the back. Unfortunately, programming capabilities on your latte machine are going to be limited because you need to prepare the beverage with cold milk. However, you could fill the reservoirs the night before, refrigerate them and load the machine in the morning. Many high end espresso machines for the home include a water filtration system. If the unit you prefer doesn't offer this feature, you will want to use bottled or filtered water when making your morning espresso. Scale and mineral build-up can be very hard on your espresso maker, so protect it as best you can with filtered water. You can learn to use an espresso machine with steam wand to create the perfect cappuccino. If your machine doesn't include a steam wand, you may consider purchasing one. Learn more about them in our guide and reviews of the best milk frothers. To bring out the best flavor from the fine (espresso) ground coffee, several home units prime the coffee with bursts of hot water before starting the pressurized brewing. This builds up moisture and releases the full flavor of the coffee prior to extraction of the espresso. If your water or milk reservoirs are removable, you're in luck! Be sure to follow any and all instructions on cleaning your espresso machine so you can get a great seal on the next brew. It's important to note that you can add more water than you need for one cup, but you'll need to revisit the coffee grounds before making another cup. This will probably require the use of a tamper to compress the finely ground coffee into the grounds reservoir or pod. Depending on how large an espresso beverage you're making, you can use the single shot filter or the double shot filter. Most espresso machines will not start if the water is not pre-heated to the proper temperature. If, however, you notice that your espresso machine is taking a long time to express the espresso or the espresso tastes burned, your machine may have pressure issues. Follow the manual instructions, and once the machine has cooled down, clean it thoroughly to make sure there's no scale causing problems. If a daily espresso drink gives you the boost you need, by all means consider investing in one of these machines. Follow the manual instructions and learn how to handle a hot, pressurized coffee drink, the steam wand and steamed or hot milk. Be aware that an espresso machine can also serve as a hot water dispenser for different types of tea, so you can satisfy all the fans of hot beverages in your home from this one machine! Did you enjoy this guide? Let us know in the comments with your favorite home espresso machine and espresso experiences.